No matter whether your new kitchen is being designed/installed by yourself or a contractor, it pays to know the type, style and accessories of kitchen units available. Most replacement kitchen units can be installed by the average diy person and is a popular home improvement feature. Each company selling units for diy installation offers a wide range of designs to suit taste, method of construction and the pocket. The two basic types types of contraction are pre--built and self assembly (or flat pack) - these terms refer to the construction of the basic carcass. Pre-built units are generally more expensive (for comparable quality of materials), require less work to install, are more rigid and offer a guaranteed quality of workmanship. Self assembly units are generally cheaper (comparing like with like), require effort to assemble, and, if assembled without due care, can often be damaged. The most widely available carcasses are made from chipboard with laminated surfaces; prices generally reflect the standard of the chipboard and laminate - different thicknesses, density (= strength) and general quality (how well the chipboard stands up to moisture, and the laminate to wear). Price can also reflect the method of assemble - generally a more expensive unit should last longer without things falling off. Self assembly units are usually screwed together while pre-built may be screwed (but in a controlled industrial environment) as well as being glued. 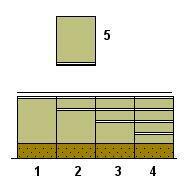 The basic units found in any range are wall floor units (1 to 4 to the right) requiring a worktop or sink to fit on the top and wall cupboards (5). Two types of basic style are used to refer to floor units - High-Line (1) where the front is one piece (normally a cupboard) and Drawer Line (2) where a drawer is at the top of the unit. A run of units tend to look better if all the units are of the same basic style. Where a sink or other appliance is inserted into the top of the unit, false drawer fronts can be fitted to give the appearance of drawer line. Drawer line styles include units with 3 or 4 drawers (3 and 4 above). On 3 drawer units, the two top drawers are normally of the same depth while the bottom drawer is double depth. The bottom drawer often is of a wire fame style to provide storage for pots/pans, oven trays etc. The drawers in 4 drawer units are usually of a common depth. Floor units are normally of a standard height and depth (front to the back) available in a range of widths - 300, 400, 500, 800 and 1000mm - 800 and 1000 mm units are double width units (normally required where a sink is fitted) offering two cupboards or drawers side by side. On double units, both cupboard doors can normally be mounted to open either left or right handed. Corner units specifically designed to use the corner space where two runs of base units met at right-angles. Tall/larder units (about 2070 mm tall). Some ranges offer a choice of drawer/cupboard combinations. Appliance units to house washing machines, dishwasher etc. These sometimes include integral doors so that the front appearance of the unit matches in with the other floor units. Various open fronted units to fit into a run or to finish off the end of the run. Note: 440 mm refers to wall units above work surfaces, the spacing needs to be at least 650 where wall units are above hobs. Standard wall units generally include one or two shelves - some ranges allow for adjustable shelf positions, either determined during installation or adjustable forever. Like floor units, wall units are available in a number of widths, 300, 400, 500, 800 and 1000mm - 800 and 1000 mm units being double width units offering two cupboards. Unlike floor units, the cupboard doors on double units can normally only be hung with the hinges on the sides of the unit. Corner units specifically designed to use the corner space where two runs of cupboards met at right-angles. Tall wall units (about 1080 mm tall). In a small kitchen with high ceilings these can easily provide additional storage space. Tall units which sit on the worktop, these give the 'Welsh Dresser' effect. Various open or glass fronted units to fit into a run or to finish off the end of the run. 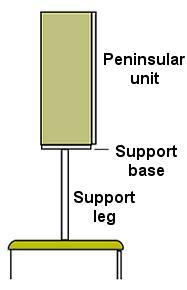 A variation of the wall unit is the 'peninsular' style unit fitted above units which are not against walls. The main difference of these units is that their backs are quite presentable as they are expected to be visible. To mount peninsular units, special support bases and legs are required to support the weight and yet keep the worktop clear for use. Most ranges offer Cornices (for above wall units) and Pelmets (for below wall units) to add a finishing touch - they give the effect that a number of units are one piece of furniture. Worktop lighting is normally concealed behind the pelmet. The plinth (between the floor and the bottom of the cupboard/drawers) adds the finishing touch at the bottom of floor units. A worktop needs to be chosen to fit on top of the base units. Worktops are generally available in 600, 850 and 900 mm widths - they are available in varying lengths from 1500 to 3600 mm. There are 4 basic styles available, the 3 shown below and square edged with only the top face finished - these edges can then be finished with strips of natural timber or other materials. Where two postformed worktops meet at right-angles, an accessory strip is required to cover the postform of one top where it runs alongside the other worktop. There is a wide choice of finishes for the worktop surface, as well as different patterns there are textured or smooth surface. Textured may look nice to begin with, but in the long term may be a problem to keep clean. Waste bin - to fit on the inside of a cupboard door of a floor unit. Storage baskets - to fit on the inside of a cupboard door. Pullout storage baskets - to fit inside a floor unit behind a cupboard door. Wine racks - either as wall or floor units in their own right or to fit inside a cupboard. Spice racks - either for fitting on the inside of a door or small units in their own right. Carousel unit - to fit into a corner cupboard to enable the best use of the space. Cutlery trays for inside a drawer. Pullout table or ironing board - normally in place of a top drawer of a floor unit, when in the stored position, they look just like a drawer. A towel rail - usually fitted in a narrow gap between 2 floor units. Tray storage area - like the towel rail, usually fitted between 2 floor units. Florescent lights for mounting under wall units to illuminate the work top - best fitted behind a pelmet to conceal the light fittings.